On March 30-31 2018, Taiwan President Tsai Ing-wen led a delegation of journalists to Hualien in an effort to support the culture and tourism of Hualien in the aftermath of the February 6 earthquake, which caused significant harm to the tourism industry. 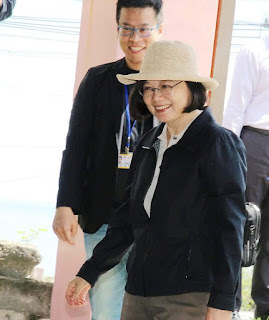 My constituency service team organized the tour, hoping to introduce some new sites and activities to potential visitors through the lenses of the press corps traveling with President Tsai. I have received many inquiries about sites she visited, so here is an introduction. 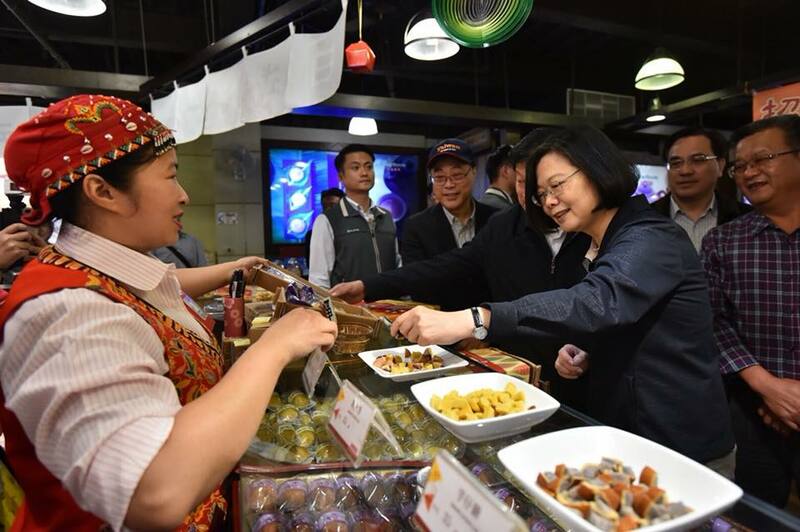 Taiwanese people just cannot avoid shopping, especially for local delicacies and food souvenirs that represent a travel experience. The mochi, a rice ball made of glutinous rice, usually wrapping red bean or sesame paste, is a common souvenir from Hualien. 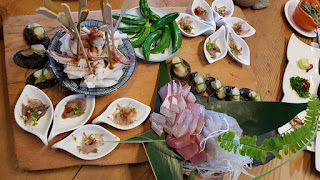 At Amis Mochi you can watch the factory production process in a guided tour and shop as much as you want for rice balls and various cakes and foods made in Hualien, some delicately designed and wrapped for gifts. http://www.amis-mochi.com.tw/ Four baskets worth of souvenirs cost President Tsai NT$4000. She has enough gifts to share with her next dinner guests. From Amis Mochis we took a turn left across the Hualien Bridge on Route 11, which is the coastal route. This coastal route borders the Pacific Ocean most of the time, occasionally winding through the Coastal Mountain Range. About 30 minutes from Hualien City on Route 11, be careful not to miss a small wooden sign in the shape of a cow, and a wooden gate named Niushan Huting 牛山呼庭. A small winding road will take you down the hill to a beach area decorated with sculptures and art, all handmade by the owner who calls himself the father cow 牛爸. Apparently, this is his family ancesteral land where cows used to graze on the hills facing the ocean. Though the sandy beach line has receded over the years due to a number of typhoons and rising sea levels, an alcove of a sandy beach and green grass was a site for filming the Martin Scorses movie Silence. It continues to be a favorite place for photographers or people who just want to relax. A nap on the grassy slope with the cool Pacific breeze would have been desirable if we were not in such a hurry. 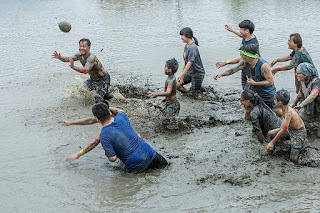 Later this month this destination will be hosting a popular music festival and party "Organik Festival"
http://mixmag.asia/read/organik-festival-in-taiwan-announces-first-names-for-2018-local where hundreds of visitors will enjoy world-class music, dancing, and camping on the beach. Our next stop was a cultural experience in Xinshe 新社 with a tribe of the Kavalan people, one of the indigenous groups in Hualien. 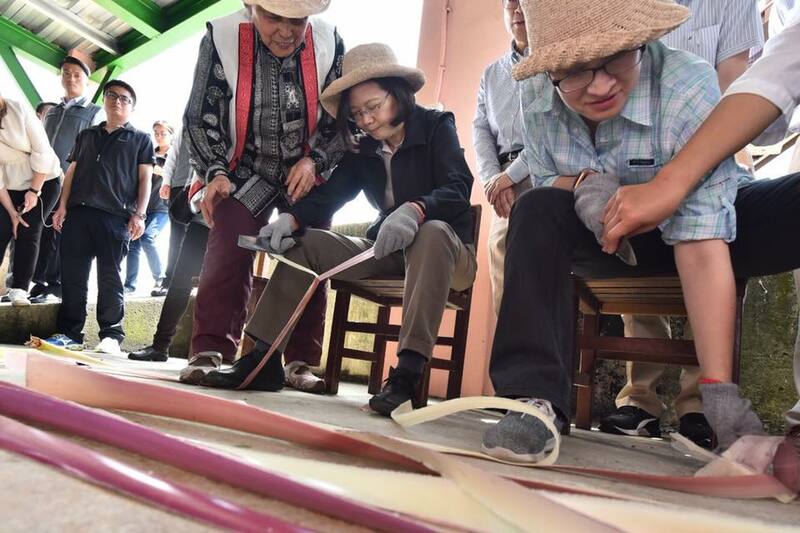 At the "Lala Ban" Banana Fiber workshop, Kavalan women were weaving banana fiber, in a long process that involves peeling the soft fresh banan tree bark, slicing the desired parts, drying the bark and stringing the fiber, and finally weaving the string into a product. It is a traditional craft which is nearly extinct, carried on by a small group of octogenarians who are eager to pass on the craft and teach anyone interested. 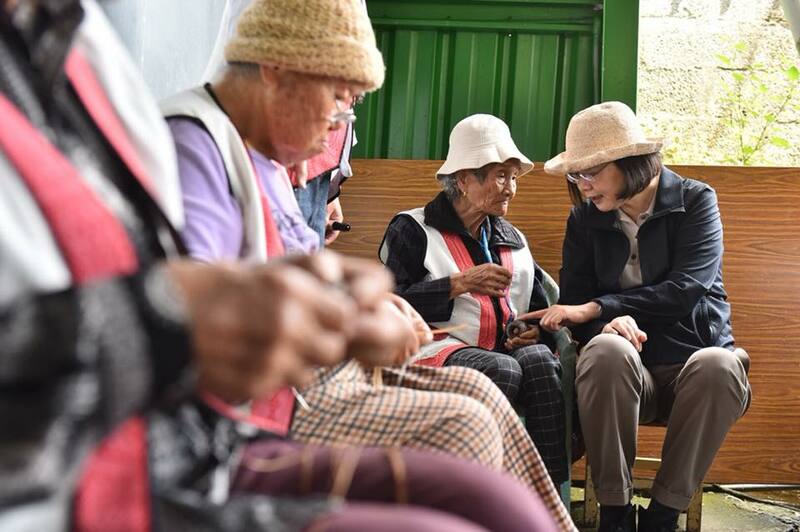 In deep appreciation of the craftswomen handiwork and their efforts to preserve this cultural tradition, President Tsai bought a handmade banana fabric woven hat which she said she would wear on her next overseas trip. 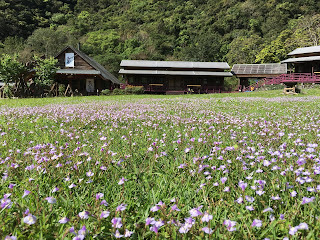 Further down route 11, the last village in Hualien bordering Taitung County is Cipu, an Amis village. Here we stopped for lunch at an Amis restaurant called 陶甕百合春天 Ceremic pot lily and spring, named after the owner's daughters. Here we had a ten-course authentic Amis quality lunch, with fresh seafood and veggies from the surrounding habitat. 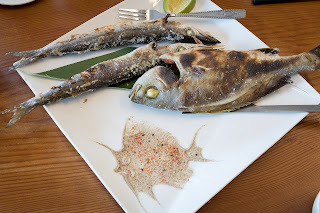 Located right next to the mouth where the Xiuguluan River flows into the Pacific Ocean, the restaurant used to be a barn where rice and grains were stored. Well converted and decorated in Amis style and art, this restaurant is a very popular spot for visitors who enjoy top quality cuisine. At NT$800 a person, there is no menu. You get whatever is caught in the ocean or collected from the mountains that day. The owner Chen Yaozhong 陳耀忠, who won a television award for hosting a cuisine show, personally takes daily dives into the Pacific Ocean to collect seaweed and various seafood. He is not only a good chef but a good entertainer as well. Joined by the next elected tribal chief Hawan and the community association organizer Guaiguai and their guitars, a performance of Amis song and music were presented as a highlight of the lunch. After lunch, we went over the coastal mountain range and into the Rift Valley. 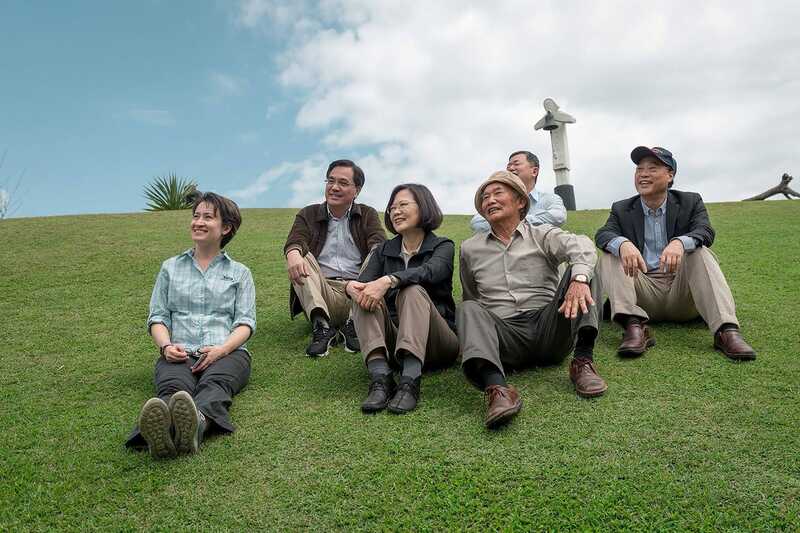 Here the township Yuli 玉里 is one of the largest producers of rice in Taiwan. Using clean water fresh from the nearby mountains for irrigation and far from polluting factories, the grains produced here are top quality. 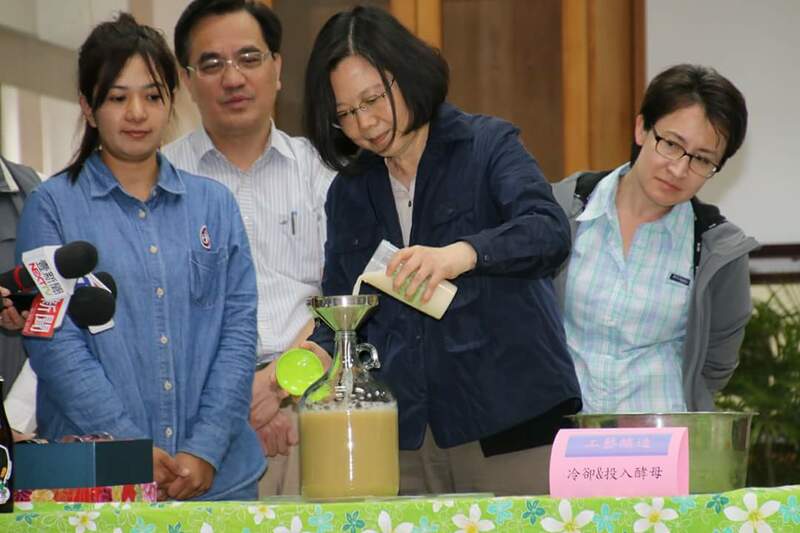 We visited a family-owned farm Dongfong, 東豐拾穗農場 one of the largest organic farms in the country. 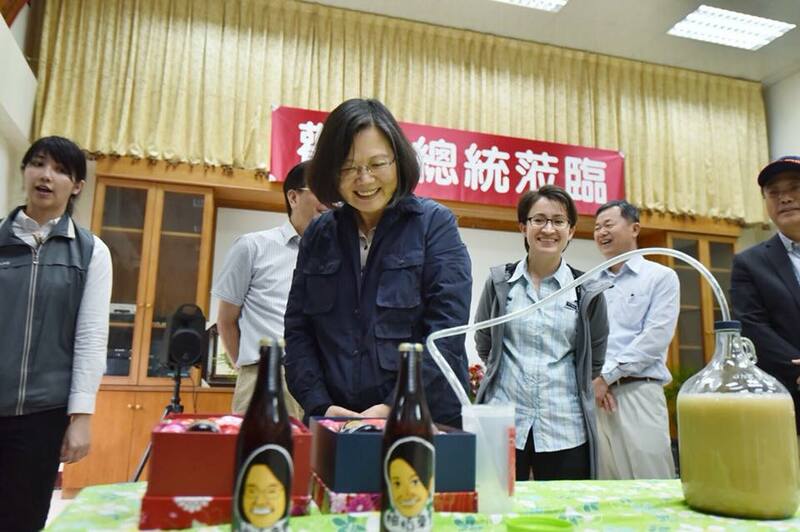 Both father and son owners have been receipients of the top honor in agriculture in the nation, the "God of Agriculture Award" 神農獎 for their outstanding achievements. The Dongfong farm grows organic pomelo fruit and organic grains including rice, beans, and wheat. On this particular day, we were not here for the rice. 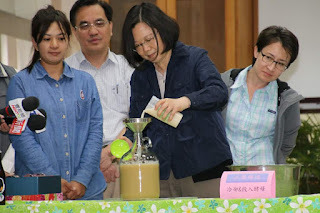 Instead we were here to take part in a DIY lesson of beer brewing, using the wheat grown right here on the farm in Yuli. Guided by the young and enthusiastic employees of the farm (yes, there are young people attracted to farming here), we took a speed course in brewing beer, a course normally taking two to three hours. After pouring in the yeast for fermentation, the process will take a further month before completion. Normally a visitor who takes this hands-on lesson in beer brewing will receive the end product in the mail a month later in six beer bottles with a custom-made label. Quite an accomplishment when you can tell people you actually made the beer yourself from Yuli-grown organic wheat! 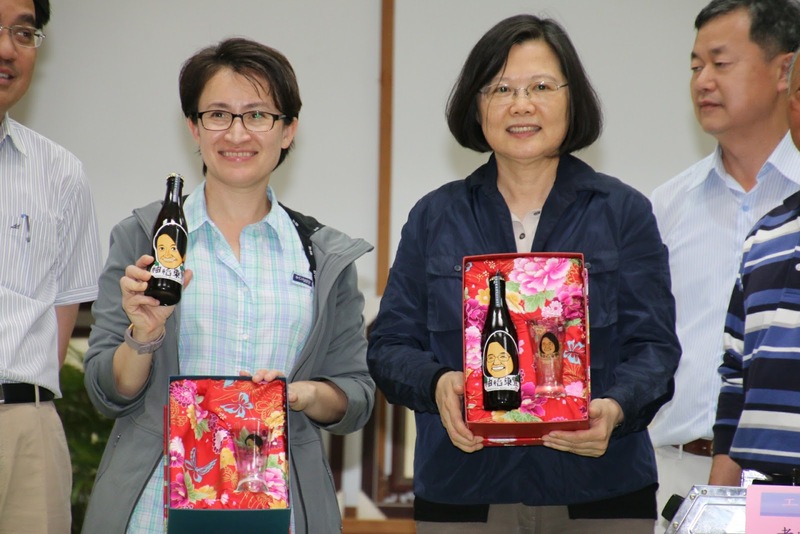 Thanks to a lot of forward planning, both President Tsai and I got a gift of ready-made beer with our cartoon labels, a one-of-a-kind souvenir from southern Hualien. The farm occassionally has openings for classes fore visitors, or reservations can be made directly to the farm for this very unique experience. So what do all the Yuli farmers eat besides rice? The township of Yuli is known for Yuli Noodles 玉里麵, which is what we had for dinner. Simple but tasty, Yuli Noodles are found all over the town center in dozens of shops. After a long day of traveling and experiencing the sites, southern Hualien provides the most comfortable way to wind down: a relaxing hot spring bath. Natural hot springs exist in the townships of Yuli 玉里 and Ruisuei 瑞穗, discovered and developed into traditional hostels during the Japanese government era. The place where the president spent the night, Yuli Antong Hot Spring Hotel 安通溫泉飯店 http://www.an-tong.com.tw/ is an old hotel that has been around for over a hundred years. Though part of the hotel has been rebuilt and renovated, the old Japanese structure has been preserved and maintained. In addition, a larger hot spring pool, equipped wiht sauna and slides, has been built in the courtyard outdoors. A group of Hong Kong high school students who were staying here on a bicycle tour in eastern Taiwan were enjoying the facilities when we arrived. Although the hotel is old, it is clean and comfortable, with steaming hot spring water available in all rooms. Rooms here range in size from twin to family rooms. We had trouble getting the entire presidential security team and entourage into this small hotel, but fortunately there are other surrounding bed and breakfast facilities and hotels nearby, also equipped with hot springs and tubs. The forty-person press group was hosted in the nearby township of Ruisuei, also with the same theme of hot springs for the night. The Antong Hot Spring Hotel was originally built by the Japanese a hundred years ago. The hot spring pool in the center courtyard equipped with slide is a favorite spot for kids.